Even as a child it caused me to not be able to sleep. Sometimes I am not even aware that it is close to the phase of a full moon. But I believe it affects my sleep and causes me to feel a bit unsettled. Will grow dark and the stars will not be visible. In and out with the pull of the sun and moon cycle. Prior to each months full moon. Here are just a few scriptures that speak about this. I think the full moon is so very pretty! I love taking pictures of it! And meditate on God's Word! To lift others up in prayer! 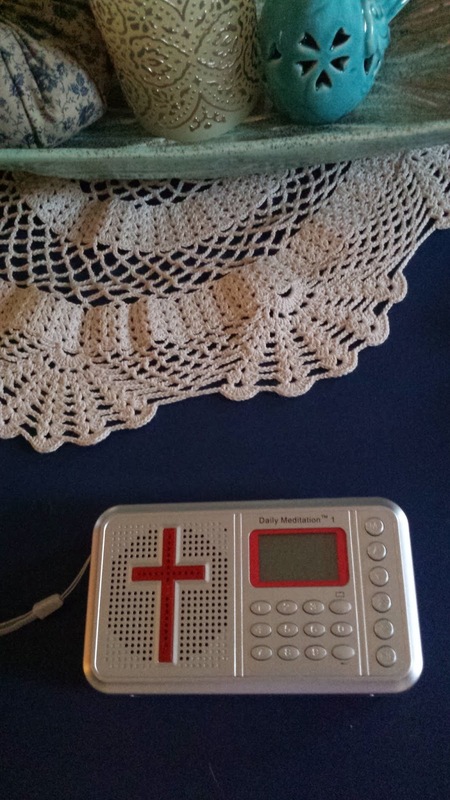 To just listen to scriptures on my Bible radio! This little radio is the coolest thing ever! Or to just read in bed using my handy book light! That little book light is the best idea ever. Rainy days and windy days make us feel. Sunshine and blue skies and all is right! Thank you Roxy. Did you catch the eclipse last night? When I got up this morning at 7 it was still dark and the moon was shining bright and beautiful. It's about 7:45 and the sun is rising and I can still see the moon fading away into it's moonset. God is so gracious to provide His children with such beauty. Have a blessed day! But what has intrigued me is your Bible radio! I quickly went to Amazon to learn more! I love sitting on my bed in the summer, especially, and looking out the window at the full moon over head. I can look out over the cottage garden as if it were daytime. I cannot sleep, so I just converse with God as I sit and watch as night settles in, and the frogs sing. The smell of the flowers, and the water feels like paradise. I breath it all in with a thankful heart. Great advice for those nights when the moon is full, Roxy. You bless me. Hi Roxy, How very interesting. I am also affected by the full moon and have trouble sleeping. It is a wonderful time to be able to meditate on God's Word and to hear from him in those waking times. That Bible radio is a great idea. We listen to audio books sometimes on Youtube. Thanks for stopping by and visiting! It is always great to hear from you! Blessings!